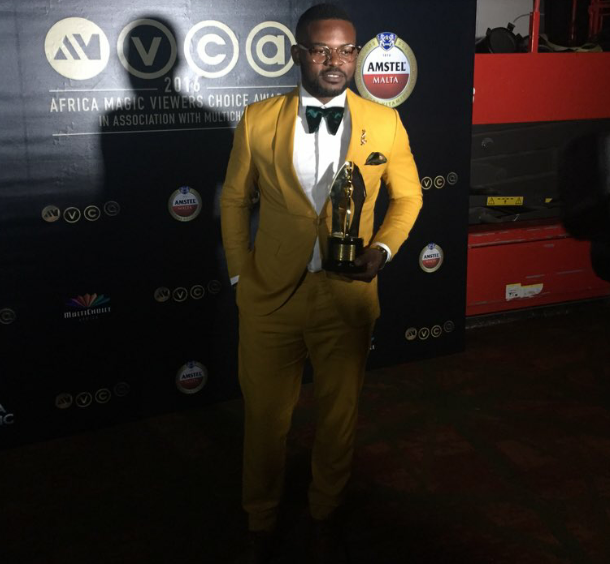 Last night, we witnessed the birth of new movie stars at the Africa Magic Viewers Choice Awards 2016 and one of them was- Folarin ‘Falz’ Falana – the bahd guy rapper who took home the award for Best Actor in a Comedy Movie/Series for his brilliant performance in the Funke Akindele-produced TV series Jenifa’s Diary. Before the event started, YNaija caught up with the lawyer-turned-entertainer on the red carpet to tell us how he got the gig. Falz explained that he was introduced to Funke by a mutual friend who recommended him for the role. When asked how he felt and what he did when he found out he had gotten nominated, Falz said he put a call through to Funke to thank her for giving him his first acting break. “I was excited. First thing I did, was call Funke Akindele because she was the one that put me on Jenifa’s Diary and I got nominated for that which was incredible”, the actor quipped, oblivious of the fact that he would end the night as a winner.